And here lies one of the film’s fatal flaws. Rogrigo? Alexander? Blackwell? Gamorr? There’s way too many Goons competing for screen dominance, it’s painful to keep up with who’s who, let alone care - you cut off one head and another five appear. And yet each of those heads are infinitely more compelling than our bland, uninspiring hero Godiss: a relentlessly wordy and maudlin would-be-philosopher and Christ figure (God? Godiss?) with a not-so-subtle white cross painted on the back of his jacket. Here’s another flaw: there’s just not enough cheese to go around. I don’t expect much in life, but I DO want more from dumb action films - shameless, consistent, mindblowingly entertaining dumbness. And some genuinely clever camerawork from another Suarez veteran, Arnold Alvaro, can’t disguise the fact that Vengeance Squad just isn’t stoopid enough. 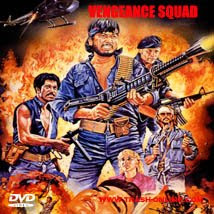 Jim Gaines on Vengeance Squad: Its a typical local film plot with a hoard of chopsuey cast. (Thats why Jett Espirito's mind was in a limbo, rewriting lines and script by trying to give everybody as much screen time possible). Producers and director just did not have enough sense that most of the cast are virtually unknown out side P.I. Well they tried anyways.